The story of this Monument is included in our National Mall Tour. Listen to a preview here and download this stop by itself or as part of the full tour! The Washington Monument is the first stop on our National Mall Tour. George Washington: the Father of America, the leader of the Revolutionary Armies, the first President of the United States. The Washington Monument is a bold statement; It is the most prominent structure in town. It is said that if you haven't seen the Washington Monument, you haven't seen DC at all. 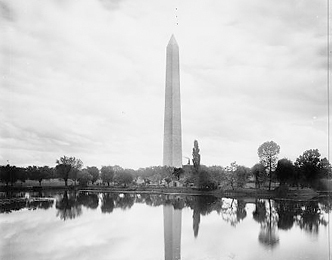 It has undergone several periods of build and rebuild to become what you see today, and the history of the Washington Monument in many ways reflects that of the country. Don't miss it, this is the number one attraction on any Washington DC Must See list.